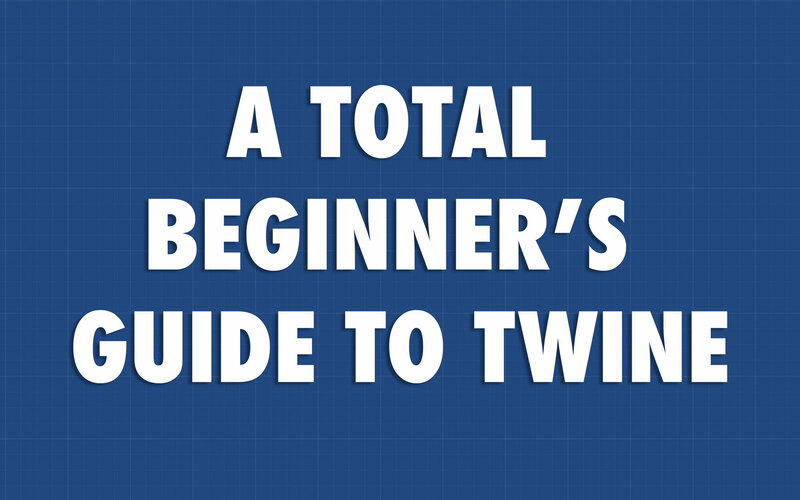 Note: This guide refers to Twine 2.0. I’ve since posted a slightly updated guide for Twine 2.1. And, oops, it looks like YouTube deleted all these videos from my old SDSU account. If anyone still cares about these old videos, email me and I’ll upload them to my University of Toronto account… I still have them kicking around somewhere. Here are some guides I’ve put together for my students in ENGL 563, “Introduction to Digital Humanities,” to get them started with Twine. Note that since my students already know some HTML and CSS, these guides assume you know what those things are and how they work together. This guide explains what a passage is in Twine and how to create links between them. These instructions apply to any story format in Twine, including the default Twine 2.0 format, Harlowe, and my preferred story format, SugarCube. Twine games are made up of “passages” — discrete chunks of texts. (In classical hypertext theory, these are called “lexias.”) Playing a Twine game involves moving from one passage to another. Passages have two elements: a name and content. The passage name is never shown to the player; it’s just used behind the scenes to guide the reader on their path through the game. The content, on the other hand, is what the user sees when they reach that passage of the game. You are in a room with two doors. You can either enter [[the door on the left]] or [[the door on the right]]. You are in a room with two doors. You can either enter [[the door on the left|leftdoor]] or [[the door on the right|rightdoor]]. Here, within the [[double square brackets]], the text before the | is what the reader sees and clicks on, and the text after the | is the name of the passage you’re linking to. Twine will create links to passages called leftdoor and rightdoor, which are slightly easier to work with than the unwieldy longer names. There are lots of ways to make your Twine game look better (with CSS) or behave more like a game (by adding variables and doing some programming). But even if all you do is make a bunch passages tied together with links, you’ve totally made a Twine game — don’t let anyone tell you any differently! A variable is container whose contents can be changed. (It gets its name from the fact that its contents are “variable.”) Think of it as an envelope. You might put a piece of paper into the envelope that says “Adam.” You might put a piece of paper into it that says 9. You might put an entire novel into it. These are the three main types of variables might want to make: text (aka “strings”), numbers (aka “numeric” variables), and true/false (aka “booleans”). Notice that you need to put quotation marks around the contents of text variables. Don’t use quotes for numbers or for true/false variables. Let’s say that you’re making a game about escaping from a castle. In order to be able to exit the castle, your player needs to find the key to the door. This key is hidden in some obscure passage of your game; you’ve made it deliberately hard to find. You’ll want a variable called something like $hasKey which will take one of two values: false when the player doesn’t have it, and true when she finds it. <<if $hasKey is true>>You insert your key into the door and it opens. You [[walk through the door|outside]]. <<elseif $hasKey is false>>You try to open the door, but it's locked, and it won't budge. You'll need to [[keep looking for the key|start]]. Twine begins by evaluating the first line of the if statement; if that’s not true, it looks at the first elseif line, then looks at the rest of the elseif lines (if there are any more), and then stops working when it reaches <</if>> which means that the if statement is over. In addition to if and elseif, you can also write else, which just means “If none of the if or elseif conditions are met, then do this.) Also, note that if you’re working with numbers, you can use conditional operators like gt (“greater than”) and lt (“less than”) instead of just is. What this all means is the following. First, Twine will check whether the value of $hasKey is true. If it is, it will display the text “You insert your key into the door and it opens” and give the user the option to click on a link to a passage where they’re outside the castle. If $hasKey isn’t true, Twine won’t display that text to the user, and the user won’t be able to click on that link. Now, Twine will evaluate the next possibility. Here it will evaluate whether $hasKey is false. If it’s false (which is it by default, since we set that as its initial value in the opening passage), then Twine will display the text “You try to open the door, but it’s locked, and it won’t budge,” and the only option will be to click on a link that takes them back to the start of the game, to re-start their search for that obscure passage where $hasKey is set to true. Let’s say you want to make a game in which you ask for a player’s name, and then give some customized feedback if you recognize it. When you're ready, click [[here]]. <<if $name is "Adam">>Hey, your name's Adam! So is mine! If the player’s happiness level is zero going in to this passage, this line of code will set it to 1 (0 + 1 = 1). If the player’s happiness level is 3 going in, this line of code will set it to 4 (3 + 1 = 4). The reason you don’t want this line to be <<set $happiness to 1>> is that this would erase any “running tally” you’ve got going, and just set the value of happiness to 1, regardless of how happy your player was before stumbling into this particular passage. <<if $happiness gte 5>>You pick up the phone and she asks you out for ice cream and you [[totally go]]. <<else>>You don’t feel like picking up. I guess you’ll never know what she wanted to ask you about. You [[stay at home]]. Here, if your $happiness variable has a value of 5 or higher (gte is SugarCube-speak for “greater than or equal to”), your player will get the chance to navigate to the ice cream passage. Otherwise — <<else>> — their only option is to proceed to the “stay at home” passage. These are just a few examples to get you started. If you get excited by this, you will want to check out this full list of SugarCube 1.x macros. If you really get into all this stuff, I would highly recommend that you then move up to SugarCube 2.0, which is a bit more complete and more fun (but which you need to install on the “downloaded”/”app” version of Twine; it’s not available on the web version). Instructions for downloading it, and full documentation, are here. This guide explains how to use CSS to change the appearance of your Twine game. All these instructions are based on the SugarCube story format. Before beginning, make sure that your Twine game is set up for the SugarCube format. To do so, click on the name of your story in its main “story map” view. Select “Change Story Format” and check the box next to “SugarCube.” Note: this guide was designed for my students, and assumes some familiarity with HTML and CSS. By default, Twine games in SugarCube look pretty awful. That should motivate you to put your own personal visual stamp on your game. Good news: since you already know some CSS, this is pretty easy. To edit a Twine story’s CSS, click on the name your story from its main “story map” screen, then click on “Edit Story Stylesheet.” This will load a screen that is just a plain old (empty) CSS file. Okay, so that changes the default settings for your whole game. But what if you want a particular passage to have its own background color, or its own special font? Again, Twine’s the best, and it makes it pretty easy. The first thing you need to do is open the passage you want to do something special with. Right underneath the passage name is an option that says +tag. Click on it to add a tag of your choosing. For instance, let’s say we want to add a tag called “hooray” for a particularly happy passage. Write in the word hooray and click on the checkmark. Now when your player gets to this passage, they will be met by a pink background and big blue text. If, like me, you’re not fond of the default sidebar in SugarCube games, you can hide it pretty easily. Just enter the following code into your story’s CSS file. As you can see, Twine does quite a bit of hand-holding. You don’t need to enter your own HTML code for paragraphs, for instance: it puts in <p>s for you. But if you’re not happy with the way Twine is inserting HTML in your game, you can enter your own HTML code right into a passage. For instance, you might want to have a spooky effect where text disappears if a user mouses over it. You could do that by sticking your own HTML div element into a Twine passage and styling it in CSS. For instance, you might have a passage that says the following. There is a spooky UFO in the sky. But you’re sure it’s there. You could then add a few lines to your story’s CSS file in which you style this div’s aliens class to make it disappear when the user’s mouse hovers over the element. This HTML and CSS code would then work together to make the words “When you look at it, it disappears” disappear when the user’s cursor hovers over them, by gradually transitioning the opacity of the aliens div to zero over a span of one second. You now know everything you need to know to create a fully customized visual experience in your Twine game. Go nuts! This guide explains how to add images and music to your Twine game, and also how to design a folder structure and use relative links. Before beginning, make sure that your Twine game is set up for the SugarCube format. To do so, click on the name of your story in its main “story map” view. Select “Change Story Format” and check the box next to “SugarCube.” Note: this guide was designed for my students, and assumes some familiarity with HTML and CSS. You are in a hallway. You see two doors: [[the door on the left]] and the [[the door on the right]]. Good coding practice requires that you enter an alt= tag to describe the content of your image in words. Otherwise, this is all very straightforward. There you have it: there’s an image in your game. You could just as easily insert a video from YouTube into your game. Just find the video you want to insert, click on “Share” under the video, select “Embed,” and copy the HTML code into your game. There you have it: there’s a video in your game. Okay, that works — but it’s not ideal. First of all, if you worked this way, you’d probably need to rely on images made by other people — things already on the web, rather than your own original content designed just for the game. Second, let’s say you release your brilliant game, and then the link to your image goes dead. Now you’ve got an unsightly missing image in your game. Worse yet, imagine that it turns out the image you grabbed off the web is under copyright, and you get an angry letter from the copyright holder’s lawyer. The way to get total creative control over your game is to design it in a folder structure you’ve created yourself. Let’s say, for example, that I make a folder called hallwaygame somewhere on my computer’s hard drive. This is going to be where my game and all of its media assets (images, audio tracks, etc.) are going to live. In the main hallwaygame folder, I’m going to put the game itself, which I’ll plan on calling hallwaygame.html (remember, Twine games publish as HTML files). Now within the hallwaygame folder, I’m going to make a subfolder called images, which is where I’ll put all the images for my game. Let’s say I’ve made my own original image of a hallway with two doors at the end. I’ll save that image as hallway.jpg and put it in the images subfolder I’ve just created. So let’s put that relative path into my previous passage as the src of my img tag. If you press the Play button in Twine, you’ll see — uh oh! — that the image doesn’t appear. That’s because when you press Play in Twine, you’re just seeing a kind of preview of your game. Where this “preview” exists is a tricky question. It’s sort of in a netherworld. It’s not published on the web for all to see; and while it’s somewhere on your computer, it’s not in a place that you can usefully access. So let’s bring the Twine game out of this netherworld and put it somewhere concrete. We do this by clicking on the story name from the main “story map” view and selecting “Publish to File.” Excellent: now let’s save our game as hallwaygame.html in the folder we created for it. Now, let’s leave Twine for a moment. Let’s go to the folder where we saved hallwaygame.html and double click on it. It will open up in a web browser — and if you’ve entered your img tag correctly, your image will display. Now collect a bunch more images for your game, and save them all in the images subfolder. Wherever you want them to appear in your game, use img tags with relative paths pointing to images/. Now your Twine game is all in one place — all contained within the hallwaygame folder. You could now upload this folder onto a webserver and it would display just as well as it does on your own computer. (Since relative paths are, well, relative, they don’t care whether they’re on your computer or on the web — all they care about is how to get from one place to another, and whether you’re on the web or on your own computer, the way of getting from hallwaygame.html to hallway.jpg is the same: look into the subfolder images, and it will be there.) You could put the whole folder on Dropbox or Google Drive, make the folder public, and share the link with your friends — instant web hosting! You could also make a .zip file out of the hallwaygame folder and email your whole Twine game, with all its images, to anyone you choose. The first thing we need to get some music (.mp3 format works best; and don’t break any laws if you’re planning on hosting your game publicly — remember the lawyers!). Next, as with images, we need to figure out where we’ll store the music. Like we did with our images, let’s put all of our music into its own subfolder of the main hallwaygame folder. Let’s call this subfolder music. SugarCube’s audio macros work in two steps. First, you need to load the songs and give them unique names (much like a variable name). Next, when you’re ready to actually play the song, or pause the song, or fade the song out, you insert a different macro in the particular passage of your story where you want this to happen. To load the songs, we’re going to create a new passage called StoryInit. This is a special passage that SugarCube treats in a special way: it executes all the commands in this passage before showing the player the first passage of the game. StoryInit isn’t linked to any other passages, because it isn’t part of the story. It’s just a place for doing mundane business related to the story. It’s a great place to initialize variables, and it’s an ideal place to load songs. The first line creates an “audio asset” named main song (though you can call it whatever you want) out of an audio file called dauphin.mp3 that is located in the music subfolder relative to hallwaygame.html. The second line creates a second audio asset called happysong out of a file called henry.mp3 that we’ve put in this same folder. This line invokes SugarCube’s audio macro, then specifies the name of the loaded song we want to play (mainsong, created in StoryInit), and then specifies an action (play starts playing the song). If you hit “Play” within Twine, you’ll notice that this isn’t working yet. Well, of course it isn’t working! We need to bring our Twine game out of the netherworld and use the “Publish to File” feature to save it as a concrete HTML file in the hallwaygame folder — its true home, where all its media assets are located! — before it will start working. If you do that, it you’ll hear your song. One you again publish your game to the hallwaygame folder, you’ll find that you now have a very advanced Twine game, complete with a soundtrack that adapts to the action! Next, you will want to check out the full list of SugarCube 1.x audio commands (it can do a lot more than just play, fade in, and fade out!). And (given the troubles I encountered in making the above video) you will also want to familiarize yourself with SugarCube 2, which works a lot better, but is a pain to install. The following handout explains how to install the SugarCube 2 Twine Story Format and how to import others’ games into your Twine environment. If you’ve made it this far, you’re not really a beginner anymore. You can make links, you can alter your game’s appearance in CSS, you can do some programming, and you can create folder structures to accommodate your media files. But let’s make it official and graduate from beginner status by installing the standalone Twine app, installing the SugarCube 2 story format, and learning how to open other people’s Twine games to see how they’re made. It’s a mystery to me why Twine uses SugarCube 1 by default. SugarCube 1 is officially out of date and no longer being actively developed. As we saw in our previous video, it has some serious problems — like, its music functionality only works in the Firefox browser. SugarCube 2 fixes all these shortcomings, but you need to download and install the Twine standalone app to be able to use it. (You access the online version in a web browser; the “offline” version, by contrast, is a program on your computer. The web-based version of Twine doesn’t let you change story formats.) So begin by going to twinery.org and downloading the app version of Twine for your computer. Next you’ll want to move any games you made in the web version of Twine into the standalone/”offline” version you just downloaded. To do that, go to the web version, click on the game you want to move over, click on its name, and select “Publish to File.” Save it somewhere you’ll remember, like in your Documents folder. Next, open up the Twine standalone/”offline” app, and, from the main screen, with the list of all your stories, click “Import From File” from the right-hand menu. Point it to the file you just downloaded in the previous step, and that story will now appear in your Story list. Go to the SugarCube 2 main page and scroll down to the download section. Click on “SugarCube v2.x for Twine 2 (local/offline) [ZIP archive]” to download the .zip file containing the SugarCube 2 files. Find this file on your computer (it’s probably in your Downloads folder) and “unzip” or “extract” it. (Windows makes this process unnecessarily difficult. Basically, right-click the folder, click Extract All, and then follow the instructions.) Now you’ll have a folder called SugarCube-2. Put the SugarCube-2 folder somewhere sensible, like your Documents folder. You do NOT want to ever delete this, so put it somewhere safe. This next step might seem pointless, but it does serve a purpose. Find the format.js file inside the SugarCube-2 folder and drag it into your favorite web browser (Chrome, Firefox, Safari, whatever). It will display a bunch of nonsense, but don’t worry about that. Just go up to the address bar of the browser, where you will see a URL that looks something like file:///yaddayaddayadda/format.js That URL is what we need! Highlight it and select “Copy”. Now, open the Twine app. (Don’t go to the online version of Twine — you need to be in the proper “offline” Twine app for this to work.) From the main Twine Stories page, click on “Formats” on the right-hand menu, then click on the “Add a New Format” tab along the top. Paste in that URL we grabbed in the previous step! Click “Add” and you should have SugarCube 2 installed. Now, go into one of the games you’ve made, click on its title, and select “Change Story Format.” SugarCube 2 should be at the bottom of the list. Select it. SugarCube 2 has some cool new macros, like <<timed>>, which allows you to do cool time-delay effect. Check out the full list of SugarCube 2 macros here. Since you’re no longer a beginner, I’ll let you figure out the rest. This is my last Twine tutorial. After this, you’re on your own. If you have questions, you can ask Google, or ask the Twine community, and you’ll probably get the help you need. If the game you downloaded doesn’t load properly in Twine (and you’re sure it is actually a Twine game) that’s probably because it was designed in Twine 1 and you’re using Twine 2. (A lot of famous Twine games, like Depression Quest and Queers in Love at the End of the World and With Those We Love Alive were made in Twine 1.) Good news: you’re no longer a beginner, so you’ll have no trouble downloading Twine 1 and opening up the HTML file in there, and reverse-engineering the game in that way! Go forth and make awesome Twine games!